Professor Michael Pender graduated from The University of Queensland in 1974 with First Class Honours in Medicine and a University Medal. 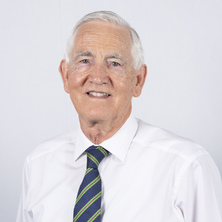 Over the next six years he trained as a physician and neurologist at the Royal Prince Alfred Hospital and St Vincent's Hospital, Sydney, and became a Fellow of the Royal Australasian College of Physicians (FRACP) in 1981. During his specialist clinical training he developed a keen interest in multiple sclerosis which he has continued since then. After completing his clinical training in neurology, he was a research scholar in the field of multiple sclerosis at the Institute of Neurology, Queen Square, London, and was awarded a PhD from the University of London and Queen Square Prize for Research in 1983. From 1984–1986 he continued this research as a Research Fellow at the John Curtin School of Medical Research, Australian National University, Canberra. In 1987 he was appointed Senior Lecturer in the Department of Medicine, The University of Queensland, at the Royal Brisbane Hospital. In 1989 he was awarded a Doctorate of Medicine from The University of Queensland for his research in the field of multiple sclerosis and was promoted to Reader in Medicine. In 1995 he was promoted to Professor of Medicine (Personal Chair), The University of Queensland. His main clinical and research interest is multiple sclerosis. He also held the positions of Director of Neurology, Royal Brisbane and Women's Hospital, from 1992–2005, Director of the Neuroimmunology Research Centre, The University of Queensland, from 1991–2007 and Director of the Multiple Sclerosis Research Centre, The University of Queensland, from 2009–2014. In 1996, with the support of the Multiple Sclerosis Society of Queensland, he established a Multiple Sclerosis Clinic at the Royal Brisbane and Women's Hospital, which he has directed since then. He is also an Honorary Senior Principal Research Fellow at the QIMR Berghofer Medical Research Institute. In 2006 he was awarded the Multiple Sclerosis Australia Prize for Multiple Sclerosis Research - 'For outstanding commitment and dedication to research into the cause and cure of Multiple Sclerosis in Australia'. In 2011 he received the John H Tyrer Prize in Internal Medicine, The University of Queensland, for research in the field of Internal Medicine. He was the Sir Raphael Cilento Orator of the Royal Australasian College of Medical Administrators for 2009 and the W Ian McDonald Lecturer of the Australian and New Zealand Association of Neurologists for 2014. Major research achievements include: the discovery of apoptosis of autoreactive T cells in the central nervous system as a fundamental mechanism of recovery from autoimmune attack (Journal of the Neurological Sciences 1991, Journal of Autoimmunity 1992, European Journal of Immunology 1994); formulation of a novel hypothesis (The Lancet 1998) proposing a failure of this mechanism in multiple sclerosis; and the further development of this hypothesis into a new paradigm (Trends in Immunology 2003) for the cause of human chronic autoimmune diseases based on infection of autoreactive B cells with the Epstein–Barr virus, some of the predictions of which have already been verified in multiple sclerosis, rheumatoid arthritis and Sjögren’s syndrome. Amino acid variants of myelin proteolipid protein: potential inducers of multiple sclerosis or potential means to a cure? Pender, Michael P. and McCombe, Pamela A. Autoimmune neurological disease. Cambridge, United Kingdom: Cambridge University Press, 2009. Pender, Michael P. (2004). Epstein-Barr Virus and Autoimmunity. In Shoenfeld, Yehuda and Rose, Noel R. (Ed. ), Infection and Autoimmunity (pp. 163-170) Amsterdam: Elsevier. Pender, Michael P. (1996). Immunopathology and Pathophysiology of Experimental Autoimmune Encephalomyelitis. In Bostock, H., Kirkwood, P. A. and Pullen, A. H. (Ed. ), The Neurobiology of Disease: Contributions from Neuroscience to Clinical Neurology (pp. 75-85) Cambridge, UK: Cambridge University Press. Pender, Michael P. (1995). Acute Disseminated Encephalomyelitis. In Pender, Michael P. and McCombe, Pamela A. (Ed. ), Autoimmune Neurological Disease (pp. 155-165) Cambridge, UK: Cambridge University Press. Pender, Michael P. (1995). An Introduction to Neuroimmunology. In Pender, Michael P. and McCombe, Pamela A. (Ed. ), Autoimmune Neurological Disease (pp. 14-25) Cambridge, UK: Cambridge University Press. Pender, Michael P. (1995). Experimental Autoimmune Encephalomyelitis. In Pender, Michael P. and McCombe, Pamela A. (Ed. ), Autoimmune Neurological Disease (pp. 26-88) Cambridge, UK: Cambridge University Press. Pender, Michael P. (1995). Multiple Sclerosis. In Pender, Michael P. and McCombe, Pamela A. (Ed. ), Autoimmune Neurological Disease (pp. 89-154) Cambridge, UK: Cambridge University Press. Pender, Michael P. (1995). Paraneoplastic Neurological Disorders. In Pender, Michael P. and McCombe, Pamela A. (Ed. ), Autoimmune Neurological Disease (pp. 327-344) Cambridge, UK: Cambridge University Press. Pender, Michael P. (1995). The Stiff-Man Syndrome. In Pender, Michael P. and McCombe, Pamela A. (Ed. ), Autoimmune Neurological Disease (pp. 166-176) Cambridge, UK: Cambridge University Press. Does Epstein–Barr virus infection in the brain drive the development of multiple sclerosis? Pender, Michael P. (2007) Tonic spasms and demyelinating lesions. Medicine Today, 8 12: 51-52. Pender, Michael P. (2006) Multiple Sclerosis: Early Diagnosis and Comprehensive Management. Medicine Today, 7 3: 14-21. Oligodendrocyte Apoptosis Before Immune Attack In Multiple Sclerosis? The Pathogenesis Of Primary Progressive Multiple Sclerosis: Antibody-Mediated Attack And No Repair? Hooper, Kaye D., Pender, Michael P., Webb, Penny M. and McCombe, Pam A. (2001) Use of traditional and complementary medical care by patients with Multiple Sclerosis in South-East Queensland. International Journal of MS Care, 3 1: . Pender, M. P. (2000) Multiple Sclerosis. Medical Journal of Australia, 172 11: 556-562. Reply to letter by Giovanni et. al. Pender, M. P. (1999) Immunoneurology. Journal of Clinical Neuroscience, 6 3: 272-273. Pender, Michael P. (1998) Genetically Determined Failure Of Activation-Induced Apoptosis Of Autoreactive T Cells As A Cause Of Multiple Sclerosis. The Lancet, 351 9107: 978-981. Nguyen, KB and Pender, MP (1996) A simple technique for flat osmicating and flat embedding of immunolabelled vibratome sections of the rat spinal cord for light and electron microscopy (vol 65, pg 51, 1996). JOURNAL OF NEUROSCIENCE METHODS, 68 2: 308-309. Johnson, David W., Whiting, Gerald and Pender, Michael P. (1993) Cervical Self-Manipulation and Stroke. Medical Journal of Australia, 158 4: 290. Johnson, D.W., Whiting, G. and Pender, M.P. (1993) Cervical self-manipulation and stroke. Medical Journal of Australia, 158 4: 290-290. Read, Stephen J., Schapel, Graham J. and Pender, Michael P. (1992) Acute Transverse Myelitis After Tetanus Toxoid Vaccination. The Lancet, 339 8801: 1111-1112. McCombe, P. A. and Pender, M. P. (1991) Lack Of Neurological Abnormalities In Lewis Rats With Experimental Chronic Serum Sickness. Clinical and Experimental Neurology, 28 139-145. McCombe, P. A., Klestov, A. C., Tannenberg, A. E., Chalk, J. B. and Pender, M. P. (1991) Sensorimotor Peripheral Neuropathy in Rheumatoid Arthritis. Clinical and Experimental Neurology, 28 146-53. McCombe, P. A., Klestov, A. C., Tannenberg, A. E., Chalk, J. B. and Pender, M. P. (1991) Sensorimotor peripheral neuropathy in rheumatoid arthritis. Clinical and experimental neurology, 28 146-153. Pender, M. P. and Sears, T. A. (1985) Vulnerability of the Dorsal Root Ganglion in Experimental Allergic Encephalomyelitis. Clinical and Experimental Neurology, 21 211-223. Pender, Michael P, Lasserre, Kaye, Kruesi, Lisa, Del Mar, Christopher and Anuradha, Satyamurthy (2008). Putting Wikipedia to the Test: A Case Study. In: The Special Libraries Association Annual Conference, Seattle, Washington, USA, (1-16). June 16, 2008. Gordon, F., Nguyen, K., White, C. A. and Pender, M. P. (1999). Rapid entry and rapid apoptotic elimination of inflammatory cells in the previously inflamed central nervous system (CNS). In: ASI 99 Dundein. 29th Annual Conference of the Australian Society for Immunology, Dunedin, New Zealand, (3.3). 5-8 Dec, 1999. McCombe, P. A., Dejersey, J. and Pender, M. P. (1993). Chronic relapsing experimental autoimmune encephalomyelitis: Studies of cells from the spinal cord. In: Joint Meeting of the Australasian Society for Immunology and Society for Leukocyte Biology, Sydney, NSW, Australia, (124-124). 1-5 December 1993. Tabi, Z., McCombe, P. A. and Pender, M. P. (1993). Flow cytometric analysis of apoptotic T cells isolated from the central nervous system in experimental autoimmune encephalomyelitis. In: Joint Meeting of the Australasian Society for Immunology and Society for Leukocyte Biology, Sydney, NSW, Australia, (97-97). 1-5 December 1993. Pender, M. P., Nguyen, K. B., Stanley, G. P. and Yoong, G. (1990). Demyelination and Nerve Conduction Abnormalities in Acute and Chronic Experimental Allergic Encephalomyelitis in the Lewis Rat. In: Takeshi Yonezawa, Satellite Symposium (Demyelination: Mechanisms and Background) of the XIth International Congress of Neuropathology. XIth International Congress of Neuropathology, Kyoto, Japan, (50-55). 9-11 September, 1990. Do antibodies against myelin proteolipid protein play a role in multiple sclerosis? Molecular interactions underpinning lesion localization in multiple sclerosis. Is autoreactivity to myelin antigens regulated differently in multiple sclerosis and stroke? What factors determine lesion distribution in multiple sclerosis? What factors affect lesion distribution in multiple sclerosis and experimental autoimmune encephalomyelitis?